This HDBaseT2.0 4K HDMI extender transmits HDMI signal up to 70meters over cat6 fluently and clearly. It is lossless in signal and supports 3D, 24bits deep color, 4kx2k, CEC, HDCP and ultra HD 4KX2K@60Hz. This product supports to power over network cable, just connect the power adapter with the receiver unit, can keep this device working well. It's a perfect solution for audio?video transmission in applications of HD conference system, HD multimedia education system, HD digital advertising and signage etc. The latest HDBaseT2.0 technology to Extend uncompressed 4K@60Hz YUV4:4:4 8bit HDMI signal over one cost effective CAT6/6A/7 cable,while maintaining signal strength and lossless video. Fully compliant with the HDMI 2.0 and HDCP 2.2 specifications and provides up to 18Gbps bandwidth.Support 4K,1080P,1080P 3D, 1080I, 720P, 576P, 576I, 480P, 480I.Delivering crystal clear image to your digital life. 4K HDMI Extender supports PoC (Power from the Receiver unit,need one power adapter only),Bi-directional extension of infrared remote control, RS232 computer data. 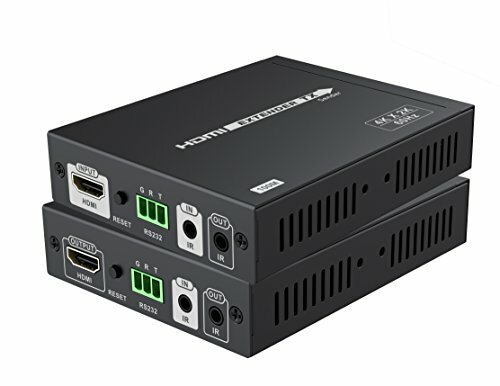 HDCP2.2 ensures compatibility with media sources;4K HDMI extender supports audio format:uncompressed audio output such as LPCM, and compressed audio output like DTS-HD, Dolby True HD. Plug and Play.Note:Does not support one to many connection and ARC.Backed with a One Year Limited Warranty and tech support. If you have any questions or concerns, please do not hesitate to contact us directly by clicking "secure4u" after "Sold by" then clicking "Ask a question".